One year after the riots of October 2006 shook the French suburbs, Adel Abdessemed’s installation at Paris’s Le Plateau was particularly worth visiting. Practice Zero Tolerance consisted of a car cast in clay, then charred and blackened. It sits in monumental fashion, almost eerie in its very physical incarnation. For many, the installation was a reminder of the burning cars that have been embedded in the public memory since last year’s unrest. Abdessemed’s exhibition at Le Plateau opened with Dazibao, a large black canvas on which generic references to current events (“Sphere”; “Separation”; “Guantanamo”) were inscribed in chalk — immediately positioning the exhibition within the political. (Dazibaos were large-character newspapers that flourished in the People’s Republic of China as a form of propaganda.) Drawn in chalk on a blackboard, intended to be erased, covered up, and rewritten, the dazibao functions a bit like the antique manuscripts on which Barthes ascribed the whole of the literary enterprise (to write, rewrite, write in echo to). Abdessemed’s dazibaos comment on the whimsical nature of propaganda, and sloganeering in general. At the same time, his painting appears black and silent. Abdessemed doesn’t claim a specific locale or a precise message — or, alternatively, he claims all of them, with little coherence. 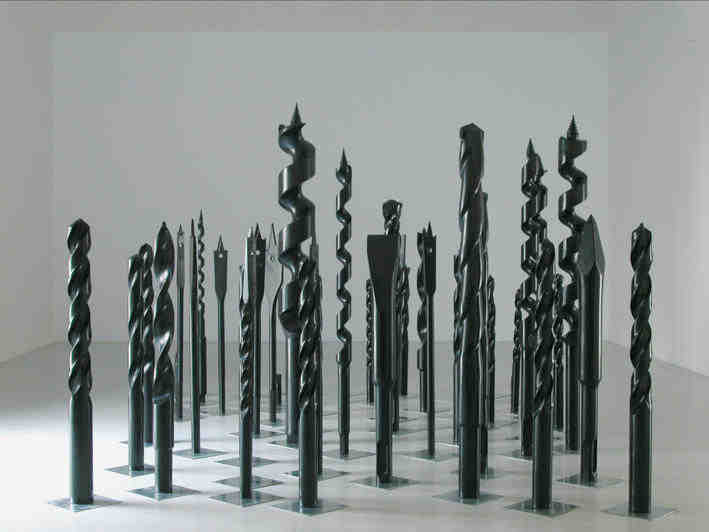 Pluie Noire — a sculptural forest composed of drills made from black marble — seemed an allusion at once to minimalist sculpture, to primitive totems, and to the draping of classical sculpture, with obvious phallic and industrial references thrown in. His Black House was a model for a utopian construction the artist will recreate in Jerusalem. This ecumenical mosque functioned as a monument-homage to the democratic project, mixing a myriad of architectural references (orthodox church, Wailing Wall, Forbidden City). Its black walls offered a blank page to the public, who were able to cover them with personal or political messages written in chalk. In mixing architectural styles, eras, and purpose en masse to create a building dedicated to public use, Abdessemed managed to throw in all the elements of an artist’s good conscience — political engagement, reference to origins, public participation — leaving the work, paradoxically, feeling a bit trivial. Such blanket appropriations of symbols and meanings fell flat, yielding work without a distinct link to time and space, in which indetermination reigns supreme. Importantly, in this, his first major solo exhibition in Paris, the young artist was short-listed for the prestigious Marcel Duchamp prize, recognizing the work of a French artist or one simply residing in France. Though the jury seems tempted to select an Arab artist — short-listing Kader Attia as well, in 2005 — they have yet to award an Arab artist the distinction. Could this perhaps be for fear of recognizing the work of an artist based solely on his origin? It’s long been recognized that France is fundamentally uncomfortable with the issue of national origins. The question bears asking. The artist remarked, when asked about the presence of the car, from which the title of the exhibition was taken, “I know that it’s best to avoid reducing my work to a single meaning; I will thus explain that it is an ambiguous object, since we can find within it different interpretations, even contradictory ones.” Finally he relented, and admitted that the burnt car was an artistic comment on consumerist modernity. Perhaps it’s better not to have artists comment about their work in the first place. Could Abdessemed be trying to escape the label of the ”young Arab artist” by not drawing too close to the subject of suburbia? Abdessemed was born in Algeria in 1971 and settled in France in 1994. Whether his work is directly on indirectly related to that reality is not really the point — but could there be a form of self-censorship at play here? We should expect a vision of the world that is his own, that is born of his particular point of view. Instead of burdening his work with layers of symbolism and commentary, some subtlety would go a long way toward communicating his purpose. Such subtlety could also help us get beyond the slippery and contentious politics of labeling the “Arab artist.” Here is a plea for nuance.